At the April 2010 General Conference of the LDS Church, Apostle Dallin Oaks spoke about Mormonism’s priesthood power and how it should be used to heal the sick. 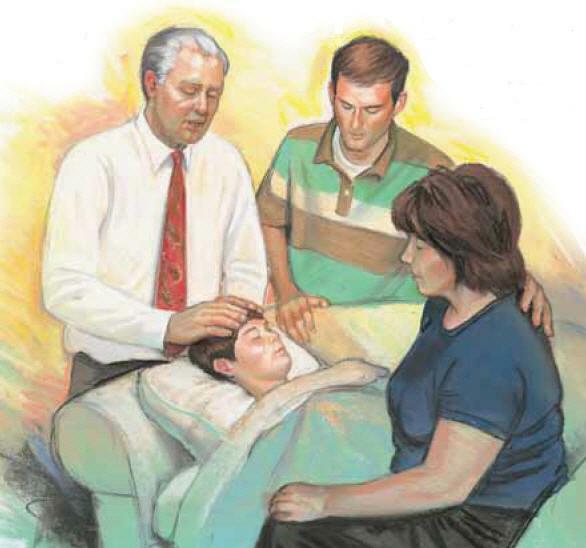 “There are five parts to the use of priesthood authority to bless the sick,” he said, “(1) the anointing, (2) the sealing of the anointing, (3) faith, (4) the words of the blessing, and (5) the will of the Lord.” Mr. Oaks’ discussion of four of the five parts brought no surprises, but his remarks concerning the part he called “the words of the blessing” did raise some questions in my mind. “Ideally, the elder who officiates will be so in tune with the Spirit of the Lord that he will know and declare the will of the Lord in the words of the blessing. Brigham Young taught priesthood holders, ‘It is your privilege and duty to live so that you know when the word of the Lord is spoken to you and when the mind of the Lord is revealed to you.’ When that happens, the spoken blessing is fulfilled literally and miraculously… For a variety of causes, every elder experiences increases and decreases in his level of sensitivity to the promptings of the Spirit. Every elder who gives a blessing is subject to influence by what he desires for the person afflicted. Each of these and other mortal imperfections can influence the words we speak. I had always thought the words spoken in an LDS healing blessing were supposed to be words of hope and comfort specifically given by God to the person receiving the blessing (with the priesthood holder as a conduit). So Mr. Oaks’ teaching made me wonder; because, to me, if someone is supposed to be declaring the word and will of God for me personally or for someone I love, I would expect those words to always be very important – and to be true. An LDS missionary, Stephanie, called me recently to follow up on a resource the Church had sent me. So I asked Stephanie if she could explain this part of the LDS healing blessing. She told me healing blessings reflect God’s word to the individual receiving the blessing. She added that, since we’re human, sometimes the words reflect wishful thinking on the part of the person pronouncing the blessing, but generally speaking, the words of the blessing are what God wants the person to hear (to uplift and encourage, etc). So, according to the pro-LDS sources I consulted, the words of the blessing are meant to be a conduit of communication from the Lord to the person receiving the blessing; they are received by the person as prophetic and inspired; they are understood to be words that “declare the will of the Lord”…but sometimes, maybe many times, they don’t. Mr. Oaks says the words are not essential to the efficacy of the healing blessing. So why does the officiator speak at all? Why even risk giving false hope or a false revelation? I have no doubt that the men pronouncing the blessings have the best of intentions, but it is a very serious thing to speak for God when He has not actually spoken (see Ezekiel 13:1-8). This entry was posted in General Conference, Priesthood. Bookmark the permalink. Well this is interesting. I'm logged in under "noclaf" and for those of you who are astute enough to figure it out, that's "falcon" spelled backwards. I don't know how that ended up on MC. Then I left the room for a second and when I came back most of my post had disappeared! Well my mind is once again spinning as I read Sharon's article. It's not a topic within Mormonism that I know much about although I know Smith founded his religion and attracted people based on the idea they would receive personal "revelation" from God. I'm always interested in how Joseph Smith and Mormonism "borrows" and counterfeits it's rituals and procedures from other sources. What we are seeing here is a practice of Pentecostal/Charismatic sects of Christianity and highlighted in First Corinthians 12:8; the "word of knowledge". This is the process by which God, through the Holy Spirit gives a particular insight into the needs or life of an individual. So here we go with Mormonism. First of all we need to ask, "What is the source of spiritual power in Mormonism?" We know that Mormons draw a distinction between the Holy Ghost and the Holy Spirit. The Mormon Holy Spirit is a force likened to something like electricity. We also know that the Mormon god is a deified man, not the God spoken of in the Bible. We also know that Joseph Smith was a big time practitioner of magic arts including scrying with magic rocks and utilizing second sight vision. In Mormon temple rituals, it's considered a treat if the spirit of a dead person makes an appearance during the proceedings. So that's the first thing that needs to be considered. Secondly, it is known that something that feels very spiritual can occur when hands are laid on another person and a trusting bond is formed. Natural observation of the practitioner and the desires of the client can work together to achieve a desired outcome. Anyone who watches the TV show "The Mentalist" knows what someone can do with the power of observation and by asking probing questions to gain information. I have no doubt that this priesthood blessing ceremony can be a very powerful tool in the hands of someone who is very skilled and a blessing to a desirous individual. The problem is that it's something that is conjured-up and has nothing to do with the God of the Bible. Oh, here I am. I'm falcon again. I was having an identity crisis there for a second with that "noclaf" handle appearing as my log in name. I don't know what direction the Mormons will go with this topic, but my guess it will be to defend this practice of the priesthood blessing and what a powerful tool it is in the life of Mormons. I don't doubt for a second that it is powerful but the question is, "What is the source of the power?" Here's the basic problem with Mormonism, it's a "feelings" experience. People go through this process and they swear up and down they have had answers to prayers and miracles and all sort of incredible phenomenon occurring. The Bible warns us that false teachers and prophets will appear and if possible fool even the elect. So I don't get too excited when people start claiming all sorts of miraculous happenings. I want to know the source of the miracle. Finally, the Mormon priesthood is a phony office, invented by Smith. A reading of Hebrews tells us that Jesus is the High Priest. But then again, Mormonism is not Christianity. Mormons have a different god and so the fact that Smith would invent a priesthood for his false religion is not surprising. “Fortunately, the words spoken in a healing blessing are not essential to its healing effect. If faith is sufficient and if the Lord wills it, the afflicted person will be healed or blessed whether the officiator speaks those words or not"
Fortunately, if God wants to heal a person, the person will be healed even if they're Mormon, and even if they're going through an inappropriate channel (i.e. Melchezidek priestcraft holders), to receive from Him. There is a strong and thorough trend in Mormonism to take credit FROM God, and give it to oneself, and/or the church. "If I'm just worthy enough…" "If the priesthood holder is in-tune enough…"
#2- I know God is the giver of all good things, and that all things work together for good for those who are called according to His purposes? God is SOOOOOO good, Mormon friends. He is SOOOOO long-suffering, sooooo merciful, so loving. So you can pretend like you have power (or like Mormon men do) and you can pretend as though you are worthy enough to speak for God. He will still act according to HIS WILL for a person, not yours, and not theirs. As a mormon growing up i was taught and believed those blessing words were given from god. When i laid my hands upon a person´s head i focused on my fellings and waited for the inspiration, which came quickly. Inspiration always work better when you have more information to work with, and i usually talked to the person about the problem/disease before the blessing. The interesting thing about it, was that the inspiration always came to me, and as i spoke the words it truly seemed like i was receiveng it from a celestial or supernatural source, because the words just flowed naturally, without me having to come up with them or think about it. At the same time though, i was always afraid to "command" someone to be healed, because i didn´t want to open my eyes and find out they were not and that i gave them false hopes and expectations. And if you pronounce something and it fails, it´s your fault. Unless the person receiveng the blessing openly admits he doubted your blessing, your authority or God´s desire to heal him. That talk gives a ground to excuse the church in case blessings fail to happen – the church can never be accused of having a false priesthood because it wasn´t the priesthood´s fault, but the man using it. Just as all things LDS, it´s based on a false spirit that´s full of doubt and insecurity. "…the church can never be accused of having a false priesthood because it wasn´t the priesthood´s fault, but the man using it. Just as all things LDS, it´s based on a false spirit that´s full of doubt and insecurity… " – AMEN! The church is true no matter what, it's just your fault for not being good enough. f_melo, are you new to the board? or an old poster with a new name? I learned a lot from your post that I didn't know. I even gave you a thumbs up for your contribution. This idea that the power is in the hands of the priesthood holder is really a dangerous concept. Think about the pride that can come from that type of thinking. It does, however, fit very well within the context of Mormonism and the Mormon male working himself into a state of deification. There's something else that I'd like to throw into the pot here at the risk of folks thinking of taken leave of my senses, and that is the sexual connection that can come from intense spiritual appearing experiences. I saw it in a church in our area about thirty years ago. The pastor led the congregation into something called "spiritual connecting" which started out sounding pretty innocent but pretty soon the intense emotions that went with the spiritual connections turned physical. I believe that's what happened with Joseph Smith. The women he seduced, some of which were married to other men, undoubtedly "felt" something "spiritual" in the words Smith spoke to them. We hear first hand stories of some of the weird and wacky things that go on in these polygamist cults. There's a huge opportunity for error and abuse when people start laying hands on others and prophecy over them, get a word of knowledge, or pray for their healing. And at the risk of sounding like Johnny One Note, people have no idea often times where these messages, blessings, and spiritually sounding insights come from. Too often they come right out of people's imaginations. Now this is coming from someone who actually believes that Ephesians 4:11-13 and First Corinthians chapters 12-13 are for today's Church. I´m very new to this board but i did post here a couple of times before with a different name. A non-lds friend of mine pointed out to me that a priesthood blessing that i had given her reminded her of what Spiritism calls "pass", their spiritual healing is very similar to that of the lds church. <a href="http://(http://en.wikipedia.org/wiki/Spiritist_healing),” target=”_blank”>(http://en.wikipedia.org/wiki/Spiritist_healing), but apparently they are more successful at it. See here's the problem, and I don't care what religious or occult experience people come out of or are involved in because it can be applied across the board. Supernatural, spiritual experiences, feelings and phenomenon can come from all sorts of sources. Once people start experimenting with the supernatural, they open themselves up to all sorts of possibilities. In the case of Mormons, the confidence of the priesthood holder and the desire of the person getting hands laid on produce an emotional energy. And believe it or not, it's not that difficult to "prophesy" or "declare a blessing" or "produce a word from the Lord" that sounds really good, feels really good and may if fact, produce a result of some sort that's interpreted as coming from God. The whole process then reinforces in the mind of both the priesthood holder and the recipient of the service (for lack of a better word) that they are connected to the Almighty. I speak of these things as one who has witnessed and experienced the process within the confines of Christianity. Regarding Mormonism, all I have to know is who the god is that they are claiming as the provider of these experiences. So here's a question for our Christian friends, would God work his supernatural wonders in the lives of people who don't acknowledge him as God? If not, than we need to ask some pretty obvious follow-up questions. Reminds me of when my friend was anointed with oil at her church for healing. It seems as if when something good happens, it's associated with God; when something bad happens, it's either punishment from God or lack of faith; and if anything happens, God willed it. People talk about highs and lows, going through them and growing from it, but really it just sounds like life itself. If we weren't so superstitious, it'd probably seem like we were kinda just left on our own. Very thought provoking post. I found myself making arguments on both sides of the issue as you presented it. I think people search for explanations about things that happen in their lives. I also think that people see what they want to see sometimes and at other times get a clear view of what a situation is all about. Let me give you an example. Two years ago I was headed out on my bike for the second time. It was very early spring and I knew that there would be sand around on the roads because in my part of the country that's what they do to increase traction on the snow and ice. As I was heading up this hill I sent-up a prayer asking God to keep me safe. I was heading down the hill where I was going to have to make a sharp turn on to another road and I reminded myself about the potential for sand. As I made the turn I saw that the road was nothing but sand. I reacted by putting on my brakes which was not a good choice. i should have just rolled through the sand and taken my chances. Well the short of it is that I lost control of the bike and went down hard. In the process I hit my head on the pavement but I always wear a helmet and it took the brunt of the blow. But I couldn't get up. To make a long story short, a couple of different cars came along right away, called 911 and off I went in the ambulance. The finally body tally was a broken collar bone, two broken ribs in the back, and a mangled right side of the body that was beyond ugly. I spent five weeks sleeping in a recliner instead of the bed. I'm really active so the whole recovery was not a lot of fun. I did figure out a way however to force my electric guitar under my arm so at least I could practice. So I asked God, "Why Lord when I just prayed for you to protect me, did I end up crashing my bike." Now I wouldn't begin to say I heard an audible voice but I "heard" this voice tell me, "It could have been worse!" I can't figure it out but I praise God that my central nervous system is in tact and I didn't suffer a traumatic brain injury and I was back on my bike in six weeks with a new helmet of course. So what's this all about. Well to me, God is God. He doesn't owe me any explanations about anything. He became a man, suffered and died for me so that I could have eternal life. Anything else that I get is a bonus. I've recently developed an interest in these priesthood blessings because two of my LDS friends (no longer as close as they once were) suffered similar injuries several years apart. I was present at the hospital when one of them was given his priesthood blessing. I remember the "priests" being allowed into the emergency room and pulling the curtain around the bed. I remember my friend's wife asking the nurse if she could step out while he was given his blessing. This concerned me, because as Christians we pray openly around the sick and not in secret. While this charade was going on I stood outside the curtain and prayed not only for healing, but also for salvation from the LDS cult. Nearly two years later my friend has just been released from detox because he got addicted to pain medication and prescription sleeping pills as a result of his injury. Incidentally, his wife is still hooked on both of those medications, and is the one that received the similar (but more serious) injury two years prior. So, through the course of time both bodies healed themselves with the aid of modern medicine. The wife went through three years of reconstructive surgery for her injury and is still addicted to narcotic pain killers. I wonder if her priesthood blessing failed? The husband healed after surgery, became addicted to prescription meds, and is in jeopardy of losing his position at work because of his addiction. I wonder if his blessing failed? My prayer for both was that God would guide the hand of the doctor's and heal them. The wife's injury was significant, and if not for several very successful surgeries she may have lost the use of her foot, or possibly had it amputated. Despite the scars from surgery (and the addiction) she is fully recovered and as good as new. I see that as answered prayer, not fulfillment of prophecy or blessing on my part. He is fully recovered (but struggling with addiction). Another answered prayer. As a result of those injuries their lives are spiraling out of control due to their addictions. They are reaching bottom and at least one of them is being humbled. The church has had no effect on their ability to fight their demons, and in fact because they are all required to put on happy faces and act like everyone in Mo-ville is perfect, it took the Christian to finally step in and get the Melchizedek priest medical help before he lost everything. Remember I said I prayed for their salvation? What is the sacrifice that God will not despise? A broken spirit and a broken and contrite heart (Psalm 51:17). I believe God may be using my friend's inability to live righteously enough to receive his priesthood blessings as a means of preparing his heart for the truth. Where there has always been prideful, testimonial Mormon priesthood hardness in the past, I see an opening for the presentation of the gospel on the horizon. I'd love to get a look at his Patriarchal Blessing. I wonder how that has panned out? Can a people be more deceptive? "People talk about highs and lows, going through them and growing from it, but really it just sounds like life itself. If we weren't so superstitious, it'd probably seem like we were kinda just left on our own." That´s very interesting. When i read the Bible i see there are only a few occasions that are unusually extreme when God has/chooses to interfere supenaturally. The other times i see God interfering on that manner are when He´s confirming the works of those whom He calls. Other than that everything else He did for the people of Israel and the Church in the Bible would seem just normal and natural. I think God works things out that way so that we don´t become dependent on Him the wrong way, in the sense that we would become reckless, lazy and irresponsible thinking that God would solve all our problems supernaturally. That would hurt our self-steem and sense of accomplishment as well. Patriarchal Blessings are a joke – the patriarch who gave me mine, wrote at least 30% of it equal to every other blessing he gave – my syster got hers with the same patriarch, and her blessing was almost equal to mine. Dependency on God is something I haven't considered. I'll come face-to-face with the emotionally-charged question of why does God let people suffer (in the form of a personal story), and I'll think of a variety of assumptions (biology happens and God lets it, God wanted the person to come home, etc). A recent study from the Templetom foundation (that's the name of it, right?) that found that prayer doesn't work for healing. They're a faith-based foundation, so there we go. The argument can go either way on that, but who knows. As for patriarchal blessings, dear lord. Expanded, general horoscopes for the faithful. I hate to be so offensive on such a sacred subject for them, but it annoys me almost as much as the praying-for-answers idea. The person who introduced me to them read hers to me back when I was an "investigator". It's just obvious. From your comments it seems that you neither understand nor appreciate the nature of priesthood blessings or the functioning of the priesthood itself. When a priesthood blessing is administered by one holding the proper authority of God (the priesthood being the power and authority delegated by God to act in His name) one is to follow the promptings of the Holy Ghost concerning what should be said. This is of course predicated upon the spiritual receptiveness of the priesthood holder giving the blessing. Having personally administered many hundreds of such blessings I can affirm that the presence of the Holy Ghost is often very strong and almost palpable. It is during such occasions that inspiration communicated from the Lord is most direct. The modern world scoffs at the notion of priesthood blessings and the power and authority of the priesthood. However, I have personally witnessed broken bodies being mended and diseased individuals being healed in a most miraculous manner that defies medical science. So go ahead and scoff. For my part I have witnessed the power of the Lord to heal those who have faith to be healed. In reference to your link, the modern world scoffs at the very notion of the miraculous. Atheists in particular love to deride all religion as being fundamentally delusional. My response to such cynicism is: "seeing is believing". Witnessing a broken body being mended or a cancer ridden individual being healed through the power of a priesthood blessing is compelling evidence to me of the love and compassion of the Lord. Notwithstanding the fact that such healings are beyond the comprehension and explanation of modern medical science, such miracles do occur and are readily documented. The modern world reviles such miracles as being part of a self-induced delusion. I say it is direct evidence of God's love and the power of faith. No Christian scoffs at God´s power to heal. What Sharon is pointing out is that in the LDS priesthood, God´s power is limited to man´s imperfections – and that notion is ridiculous! God´s work and will are not hindered by man´s weaknesses. I would like to ask you – how do you get in tune with the Spirit? Is that how God really works? Can you imagine if God was to wait for Moses to be in tune with the Spirit when he was rushing away from the Egyptians towards the Red Sea? When He speaks He makes His voice heard without interference. For me, tuning to the Spirit was just a concentration exercise…like one of those eastern type of meditations…and i definetely picked up stuff that wasn´t from God. Yes, they tend to scoff at anything supernatural. I don't think half of em would believe in God unless He came down here Himself. As for those medical miracles, I'm willing to bet not all of them are LDS. My own church's pastor has witnessed the same thing you have as well. I'd find that odd if I believed it took a special priesthood authority to heal through prayer, but since I don't, I see no reason why not to scoff at Mormon priesthood authority for being unnecessary. Is the power of the Holy Spirit to heal really limited to LDS priesthood holders, as Mormonism implies? This is why I always want to know the source of the power claimed by religious people for the spiritual manifestations they testify to. What's that old saying, "All that glitters isn't gold." I could provide a steady stream of claims by people regarding the miracles that have been wrought in their lives. I'm only impressed if they claim that the healing was the result of the manifestation of the Spirit of God in the name of Jesus. Jesus plainly taught that folks would claim that they did all sorts of miracles in His name but He will tell them depart from me I know you not. The Mormon Jesus is not the Jesus of the Bible. The Jesus of the Bible is the physical manifestation of the invisible God. The Mormon Jesus is the spirit off spring of a man who became a god and one of his goddess wives. The Mormon Jesus isn't "God", he is "a god" a valiant older brother of Mormons. So it's plain that the source of the Mormon priesthood authority and "power" is not Jesus. Mormon priesthood holders are so intoxicated by their false power that they won't see through the deception and receive deliverance and salvation from the Jesus of the Bible. So 77………………….the power of the priesthood does the healing. Thank you for that valuable insight. In Christianity, Jesus is the healer. This is a very important difference between Mormonism and Christianity. This is what I know, and I pointed it out at the beginning of this thread; the power to heal, for example, and the manifestation of the gifts of the Holy Spirit come from the God who is revealed in the Bible. He is the source of the power we operating under. Now two points: (1) You have told us that the power in Mormonism comes from the priesthood and (2) We know that the Mormon god is a deified man who lives some where near/on the planet Kolob. I have no doubts that you can conjure up blessings and possibly even miracles or healings by the god you claim. Remember this however, there is a price to pay for selling yourself to the source of your power and that's eternal separation from God. We are given several examples in the Book of Acts of the power of God vs. the power of the occult. Acts 19:13-16 shows some men trying to co-op the power of God. The best example is Acts 16: 16-19. The young slave girl in the example had what is known as a "familiar spirit". She was shouting out positive affirmations about God. Paul called the demon out of her. Why? Because he didn't want the gospel he preached to be high jacked by the demon. In-other-words, the demonic spirit was seeking to associate itself with the living God. Mormonism is clearly a religion founded on the occult. However there's just enough Christianity mixed into it to mask what it really is. The deception is clear to those of us who are born again by the Spirit of God. But to Mormons, the counterfeit appears to be the real thing. I have a book here, 1990 vintage titled, "Lord of the Air". The cover description of the contents of this real life account reads, "Deep in the heart of India, a man who claims to be God dazzles 20 million devotees with miracles and spiritual powers………" Of the author it says his "…. eyewitness account takes you into the inner circle of the greatest 'enlightened master' in the East…. Mormons, especially those drawn to the supernatural, think that they're appropriating the power of "God" but in reality they are calling on "a god" to perform for them miracles and signs and wonders. This "god" is more than happy to oblige them to their heart's content with his counterfeit miracles and confirming spiritual feelings. At the same time, Mormons practicing the priesthood craft, can conjure-up their own spiritual ambiance that is an expression of their personal desires and those on the receiving end of their efforts. This is, whether coming out of the soul of the practitioner or from the entity known as the Mormon god, powerful stuff! It is deluding. That's why Mormons get sucked into this. And what prideful Mormon male, who thinks he's on the path of enlightenment to become a god, would want to give this up. Can we hear the refrain, "I have the power of the priesthood. I'm going to become a god", echoing through the chambers of their minds and exciting their emotions? It's pretty tough to disabuse someone of this notion of priesthood power and personal deification. Mormons have chosen badly. They've rejected the God of the Bible and embraced a type of new age philosophy of personal growth and progress on a pathway to becoming a god themselves. This will end badly unless they repent and acknowledge their sin and receive the free gift of eternal life that God is offering them. have led them into believing false doctrine about God to the degree that their salvation is at stake. 6 – "And it came to pass that when the brother of Jared had said these words, behold, the Lord stretched forth his hand and touched the stones one by one with his finger. And the veil was taken from off the eyes of the brother of Jared, and he saw the finger of the Lord; and it was as the finger of a man, like unto flesh and blood; and the brother of Jared fell down before the Lord, for he was struck with fear." I would like to answer the question you pose at the end. I would say that God would work His supernatural wonders in the lives of those who don't acknowledge Him, and I would call it prevenient grace. Some might call it common grace, but it's God's grace nonetheless. The problem with the Mormon approach to anything is its emphasis on the worthiness of humans rather than the holiness of God and His sovereign power and authority. I guess what you're saying here is that the priesthood blessing has the same effect as a sugar pill but it's the believing that causes the cure. I can buy that. I've seen people change their attitude from depression to happy face based on the fact that someone said something to encourage them. In fact there's a whole form of psychology that's called cognitive-rationale therapy where the clinician gets the client to change their attitude by changing the way they think about things. Pretty complicated stuff this idea that our thoughts drive our emotions. Years ago I was a major consumer of every form of self-help literature and success and motivation tapes. I've also been fascinated on how "psychics" ply their trades. Now it goes without saying that what some folks tap into is the dark side of the spirit world. but much of what goes on is simple human psychology and interpersonal dynamics. My goal, as a Christian who believes in the manifestation of spiritual gifts as described by the apostle Paul in First Corinthians 12-14, is to separate out the legitimate move of God's Holy Spirit from those things that are not. I was watching a guy on GodTV the other day in a "Open Heavens Prophetic Conference" talking to people about how he trains Christians to use the gift of prophesy. Well that caught my attention. I had this nagging feeling that there was a real opportunity here for abuse. But I'm giving the guy the benefit of the doubt hoping that he was teaching people in line with what the Scriptures say. Anyway, I think Mormons just simply dive headlong into this priesthood mode, which by the way is not an office or calling in the Christian faith, and use the power of suggestion and their own active imaginations to produce desired outcomes. The possibility of some of these folks tapping into spiritual forces not of God is a real danger since Mormonisms roots are in the occult. Hi everyone. Since gravatar wouldn't accept my name (Mike R) I changed my user name to,"wyomingwilly".